In this short article, we would like to bring you some insights into the production of the Effetec UV digital printer to the customer, its subsequent installation and putting the machine into operation. 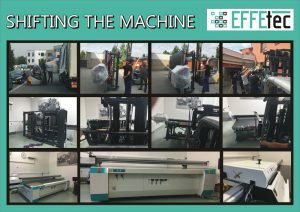 As we move our machines to the customer, we have experienced many quaint and varied moments and situations. We have moved through the window to the floor of the building, the roof of the building using a crane and a shop window. At the last delivery of the machine, however, we have gained a further experience with the customer when moving the machine through a standard door. By allowing our customer to remove only a part of the wall into a height profile, we have really combated conditions for his placement of the printer on the job. However, our company Effetec took the challenge and engaged in this challenging task with enthusiasm and determination. I cannot fail to mention that the great share of the successful event was played by the experience and the masters in the field of our permanent transport. The great professionalism of the owner of the company when working with a forklift truck has allowed us to perform a completely non-standard handling of the machine. It was necessary to lay it across and then move it to the building in this unusual position. The highlight of this demanding action was to pass a forklift with a machine-mounted door and install it at the customer’s required place, follow-up machine installation, recovery and putting the machine into operation. Here are some photos of this interesting event.